H.E. 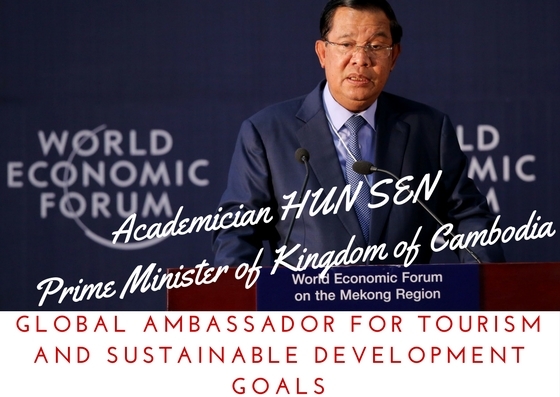 Professor Dr. Anton Caragea held the distinct honor to keep the opening speech for the nomination of the first GLOBAL TOURISM AMBASSADOR named for a full term mandate for the period of action of Sustainable Development Goals Agenda until 2030. 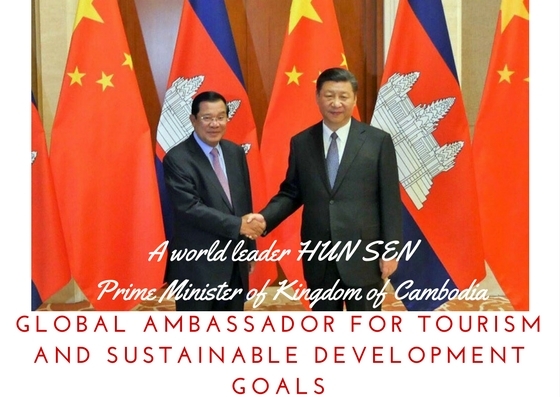 Tourism is in the world of today a linchpin in achieving and enhancing world development, creating much-needed employment and opportunities for growth and social inclusion and creating much needed economic resources to be used to protect and promote the cultural heritage. During the European Council on Tourism and Trade (ECTT) official visit to Ethiopia, ECTT President, Professor Dr. Anton Caragea, met with Prime Minister Hailemariam Desalegn, Foreign Minister, Tedos Ghebreyesus, State Minister, Berhane Gebre-Christos, Yaekob Yalla, Minister of Trade and Minister of Culture and Tourism, Amin Abdulkadir, to create a climate favorable for tourism and trade development and for awarding to the people and Government of Ethiopia, the world most important recognition for tourism advancement-WORLD BEST TOURIST DESTINATION AWARD FOR 2015. 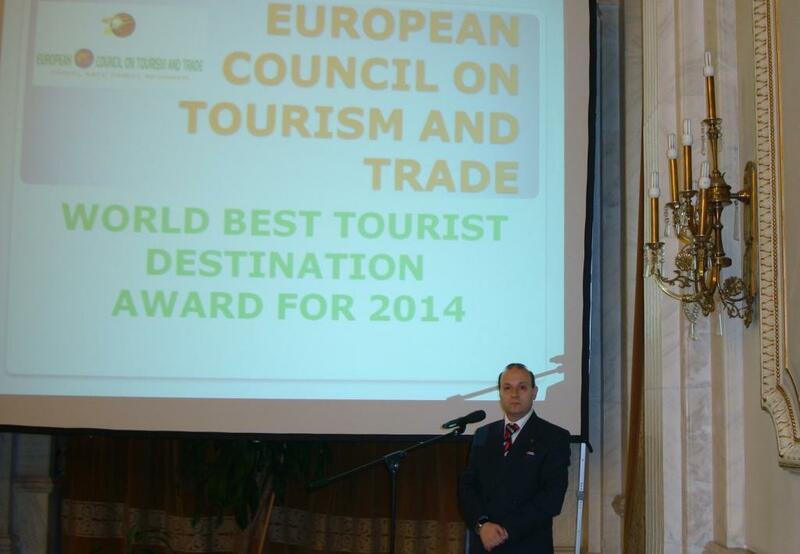 European Council on Tourism and Trade President Office organized on 6 December 2014 the official ceremony to present to the public the BEST EUROPEAN WINE FOR 2015 and to uncover the names of the BEST WINEMAKERS OF THE YEAR. The ceremony is instrumental for HORECA and tourism industry representatives in keeping in touch with the news and the best wine producers from Europe in order to present this product`s for trade, for tourism events and for leisure and for the full comfort of the clients. 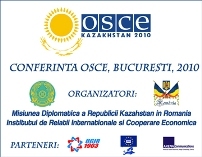 The EUROPEAN DIPLOMATIC WINE will be presented on all the venues and events organized by EUROPEAN COUNCIL ON TOURISM AND TRADE during 2015 and will be offered at protocol gifts to the world leaders and presented on the rostrums of World Best Tourist Destination and World Capital of Culture and Tourism as a part of the intangible European heritage. On the occasion of the International Wine Fair-Good Wine 2014, the ceremony for unveiling EUROPEAN DIPLOMATIC WINE for 2015 has taken place. The EUROPEAN DIPLOMATIC WINE selection is destined to present to the world the main values of European wine culture for 2015 and will represent the embodiment of the BEST EUROPEAN WINES FOR 2015. From left to right: Deputy General Secretary of Government-Liviu Neagu, Mrs. Simona Man- Minister-President of National Tourism Authority, Prof.Dr. 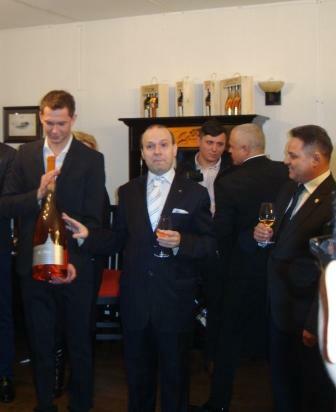 Anton Caragea-President of European Council on Tourism and Trade, Victor Deleanu-President Cotnari House of Wines-creator of DIPLOMATIC WINE, senator Ionel Agrigoroaei, Stefan Timofti-sommelier House of Wines-COTNARI. The ceremony has taken place in the presence of the Diplomatic corps, accredited to European Council on Tourism and Trade, European personalities, European tourism Academy leadership, Minister of Tourism-Mrs. Simona Man-President of National Tourism Authority, European Parliament representatives and Deputy Secretary General of Romanian Government-Mr. Liviu Neagu. The ceremony was opened by the tasting of the diplomatic wine-Feteasca Neagra (Black Girl) from Cotnari House of Wines, Dominium series. The Prize for DIPLOMATIC WINE FOR 2015 creator- Chairman of COTNARI-House of Wine-Mr.Victor Deleanu. The wines where introduced to the public by the Cotnari House of Wines sommelier –Stefan Timofti , who underlined the pure Romanian traits of Feteasca Neagra wine ilk, who’s traces in history goes as far as Cucuteni Culture (5.000 years ago),a perfect representative wine for Europe and House of Cotnari. In sign of recognition of the intrinsic value of the Feteasca Neagra wine, produced by COTNARI House of Wines, the Deputy Secretary General of the Government, Mr. Liviu Neagu handover on behalf of European Council on Tourism and Trade the special prize for the wine maker George Malutan, who was hailed as the WINEMAKER OF THE YEAR. Mr.Stefan Timofti-sommelier at COTNARI-House of Wines is unveiling the Grasa de Cotnari (place II at Diplomatic Wine 2015). Afterwards was tasted the second place on diplomatic wine competition, the famous Fat Lady of Cotnari (Grasa de Cotnari), dry wine, a historical achievement. The Grasa de Cotnari wine is an old traditional wine, in use at the Moldavian king’s court. 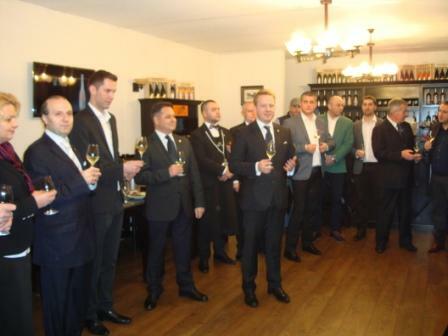 The wine expert and sommelier of COTNARI House of Wines, Mr. Stefan Timofti, outlined for the public benefit the main characteristics and the typical structure of the wine assortments from Grasa de Cotnari. This is considered as a high quality and long lasting wine, famous around the world. 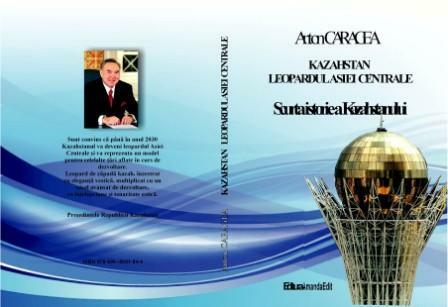 The Senator Ionel Agrigoroaei has presented the prize for BEST WINEMAKER OF THE YEAR to the Victor Deleanu – Chairman of COTNARI-House of Wines, in sign of recognition for his exertions in promoting European wines on international stage and for the tremendous achievement of being elected as the creator of the DIPLOMATIC WINE FOR 2015-Best wine of Europe. The long awaited moment, of EUROPEAN DIPLOMATIC WINE ceremony, had started with the public presentation of the best wine-Bohotin Basil (Busuioaca de Bohotin) an exceptional wine by his traits of persistence, pun gent aroma of exceptional quality. The Busuioaca de Bohotin obtained the first place as the perfect wine, encompassing aroma, technologies and long lasting palates. Professor Dr. Anton Caragea, President of European Council on Tourism and Trade, together with Tourism Minister President Mrs. Simona Man, presented the Chairman of COTNARI House of Wines Mr. Victor Deleanu with the Prize for DIPLOMATIC WINE FOR 2015. This was in appreciation for the company role in promoting European wines and for constructing the wine that will be promoted for a year long period, as the quintessence of everything that European wine industry is having precious. Ambassadors and diplomatic representatives accredited to European Council on Tourism and Trade on the venue of the Diplomatic Wine ceremony: center stage H.E. 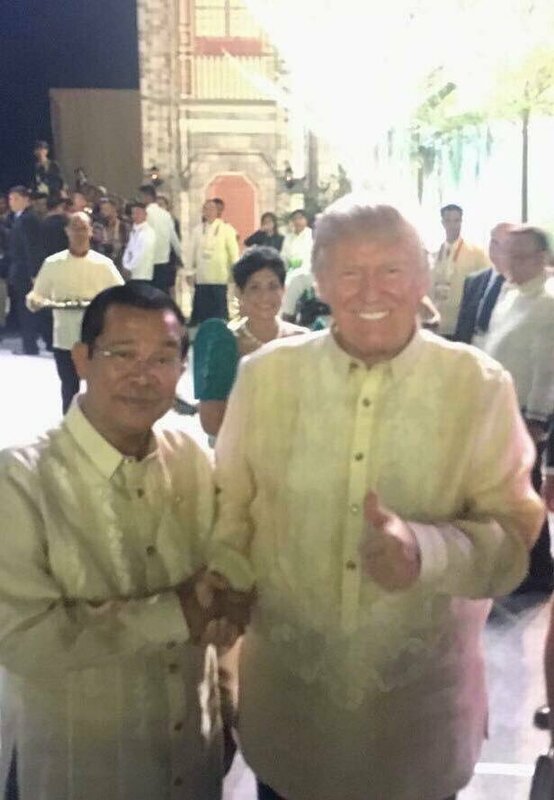 Vietnam Ambassador in Romania-Tran Xuan Thuy. 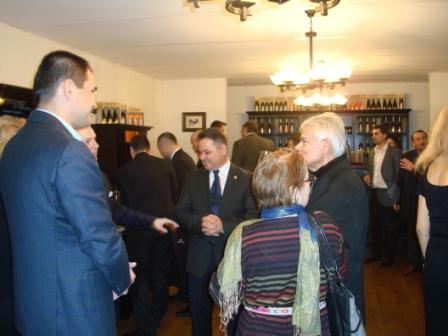 In the closing moments of the festivity, the ambassadors and European officials, took the opportunity to enjoy countless wines from COTNARI house of wines and received special wines, branded for the event, ambassador wines, that will spread the magic of the Romanian and European wines across the world. 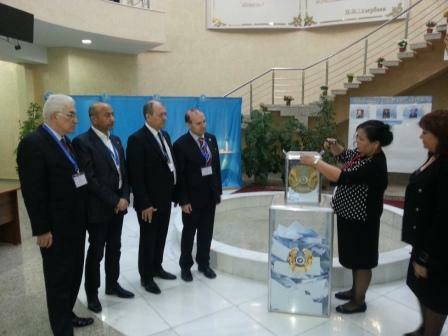 Sharing a lighter moment: General Secretary of the Government-Liviu Neagu, Senator Ionel Agrigoroaei, and Venezuela Ambassador H.E. Victor Ramon Carazo. 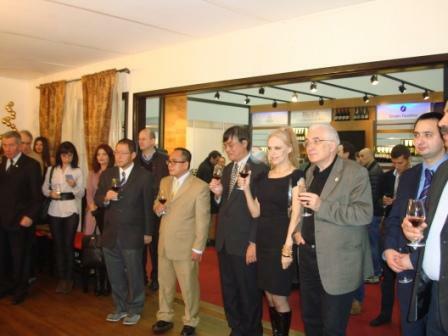 The Ceremony for Diplomatic Wine for 2015 marked a central point in promoting European wines authentic values and highlighted the economical and oenological tourism potential of Europe on a world stage. 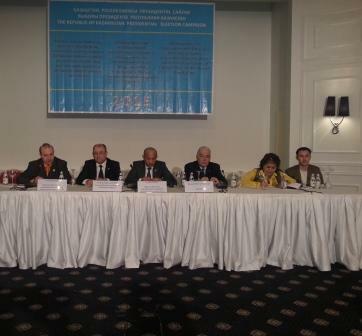 On the occasion of the General Assembly of the European Council on Tourism and Trade, H.E. 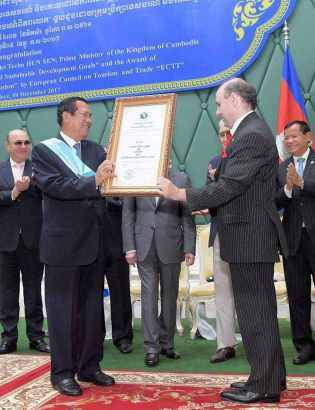 Professor Dr. Anton Caragea held a key note speech analyzing the efforts of Lao PDR, former receiver of WORLD BEST TOURIST DESTINATION AWARD FOR 2014 and praising ZIMBABWE the new receiver of the world most important touristic distinction: WORLD BEST TOURIST DESTINATION. 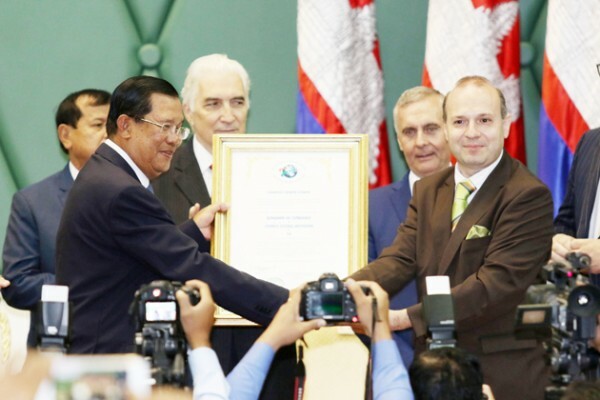 Republic of Laos had leveraged the award in accordance with rules and regulations, which proved useful for attracting new tourists and investors. In 2013, Laos PDR recorded the highest increase in the number of incoming tourists in the world with a staggering 8% increase during the 2013/2014, despite the world economic crisis. 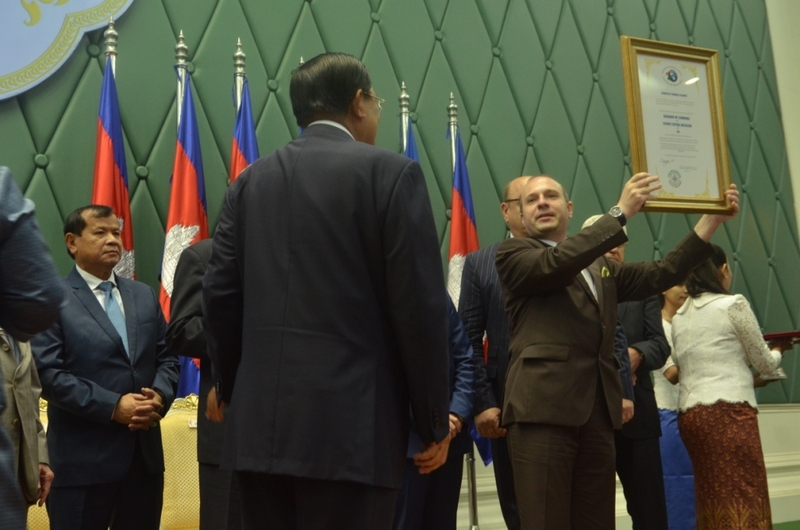 An increase in investment, in the country’s tourism potential and the number of foreign visitors were the positive outcomes of the WORLD BEST TOURIST DESTINATION AWARD for Lao PDR, concluded Professor Dr. Mircea Constantinescu. 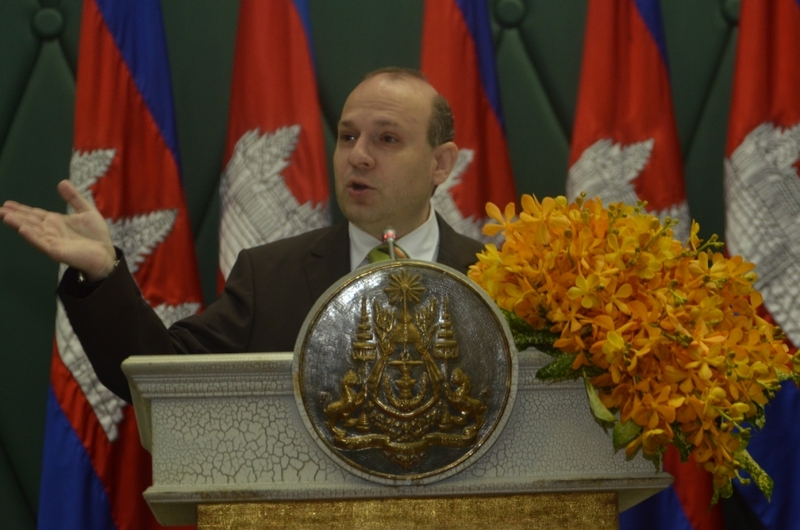 Professor Dr. Anton Caragea also praised the outstanding commitment and achievements of Laos tourism in 2013. 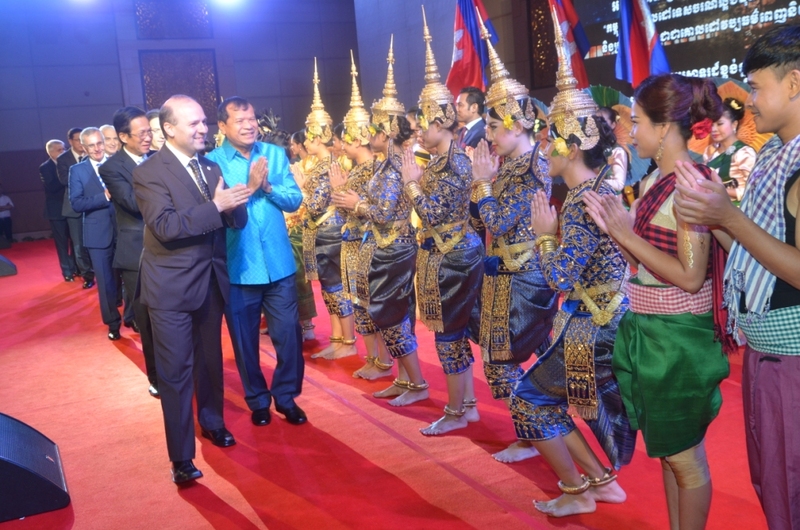 Laos PDR also boosted its international presence, with European companies and tour operators that advertised sites and trips to Laos PDR increasing from 1.500 to 3.200 in less than a year. 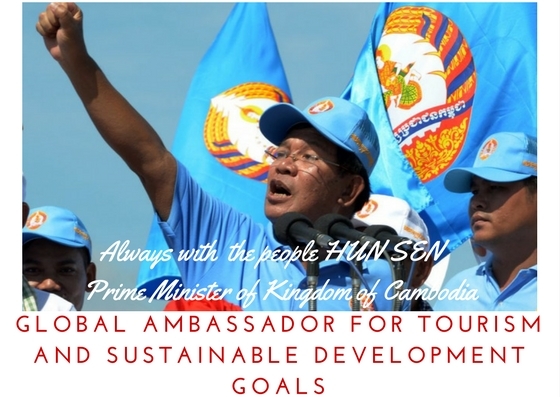 On internet, the number of pages promoting Laos biodiversity and tourism facilities increased from 20 million to more than 50 million, an unrivalled increase in the recent history of tourism marketing on internet. The 8% growth of the tourism industry, during these times of worldwide economic recession, is also unmatched by any other country, said ECTT President-Professor Dr.Anton Caragea. On the debate for the WORLD BEST TOURIST DESTINATION AWARD FOR 2014, Professor Dr. Anton Caragea, President of European Council on Tourism and Trade (ECTT) presented a report titled: ZIMBABWE: THE PERFECT AFRICAN DESTINATION; A SEVEN-WONDER DESTINATION IN TOURISM AND CULTURAL POTENTIAL. He proposed ZIMBABWE as the winner of WORLD BEST TOURIST DESTINATION FOR 2014 and as receiver of the FAVORITE CULTURAL DESTINATION distinction for 2014.  The excellent organization of the 20th Session of the World Tourism Organization General Assembly from 24-30 August 2013. The world gathering brought together tourism experts from more than 120 countries.  The successful organizing of this world event, inspite of huge logistic and economic challenges, proves without doubt, the capacity of Zimbabwe Government and the tourism industry’s capacity to organize world level events. Following a magnificent vision and the organisation of a successful world tourism meeting, ZIMBABWE has unequivocally demonstrated that it is a safe, open and perfect tourism destination. The support offered to the promotion of Community Based Tourism, which ensures the survival of sustainable tourism, with its with low ecological impact and preservation of natural biodiversity and protection of endangered species in Southern Africa. Community based ecotourism, promoted by Minister Walter Mzembi, is a perfect way of sharing revenue that supports rural communities’ prosperity through opportunities to market their foodstuffs and handicrafts to the world. The way in which eco-tourism has become the base for local economic development, providing benefits to communities, makes eco-friendly tourism the lesson that the REPUBLIC OF ZIMBABWE is offering to the world.  Giving tourists access to outstanding and pristine nature and the opportunity to explore nature, to contribute to ecological preservation, and the opportunity to visit extraordinary places such as: the unique landscape of Victoria Falls; the National Parks such the Eastern Highlands in Manicaland; the Mana Pools in Mashonaland West; Exfoliated Hills from Matebeland; Chilojo Cliffs in Masvingo and the Matobo Hills near Bulawayo etc. All these regions and national parks, are a model of achieving ecological and green tourism that must be recognized throughout the world.  The ongoing development and protection of cultural and historical shrines of the Republic of Zimbabwe, the transformation of Harare into a historical and spiritual centre, offering to the visitors a glimpse into rich culture and heritage of peoples of Zimbabwe.  The preservation of outstanding historical and cultural heritage in the form of the former capital of the Shona Kingdom, the Great Zimbabwe in Masvingo, a fortified palatial complex from the 12th Century, offering a rare insight into one of the greatest pre-colonial civilizations of Africa, and a rare window into centuries old traditions.  Today, Great Zimbabwe Monument also offers tourists an open air museum with a rare collection of historical and archaeological treasures that educate and enrich the world.  The preservation of cultural and natural sites of world significance and value such as: Great Zimbabwe National Monument (added to UNESCO list in 1986), Khami Ruins National Monument (added to UNESCO list in 1986), Matobo Hills (added to UNESCO list in 2003), Mana Pools National Park, Sapi and Chewore Safari Areas (added to UNESCO list in 1984), Mosi-oa-Tunya / Victoria Falls and UNESCO candidate regions as: Ziwa National Monuments dating from the Stone Age period, make destination Zimbabwe to offer an incomparable contribution to the world legacy.  The REPUBLIC OF ZIMBABWE is today a hot spot for adventure tourism, offering large areas suitable for this special kind of tourism, and the necessary infrastructure to welcome the adventure seeker, its safety and peace, makes the country, one of the world’s top adventure destinations.  Keeping alive indigenous traditions, allows tourists and visitors to be part of the Zimbabwe people’s social fabric, which offers the possibility for an enriching cultural experience, are all achievements that make the REPUBLIC OF ZIMBABWE a first class destination. 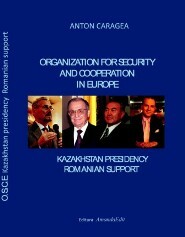 After hearing the report, Senator Ionel Agrigoroaiei, from the Romanian Parliament and Director of European Parliamentary Committee in the European Council on Tourism and Trade expressed the views of all present at the gathering when he declared that the REPUBLIC OF ZIMBABWE is the deserving candidate, with a perfect record of promoting eco-friendly tourism, ecological and socially oriented tourism, and that only a unanimous vote in favor of the REPUBLIC OF ZIMBABWE, could express the unwavering European tourism and economic communities’ support for such a world model. Mr. Victor Deleanu, ECTT rapporteur also presented a report titled “ZIMBABWE: A HOT SPOT OF ADVENTURE TOURISM” which praised the country for its safety record, infrastructure and hospitality industry’s achievements that make Zimbabwe an attractive destination in Africa. Mr. Mihai Prundianu, Chairman of the Trade Mission of the ECTT, also highlighted the importance of the moment as the continent celebrated 50 years of African Unity, it is appropriate for Europe to express its commitment to, and appreciation for, Africa by crowning ZIMBABWE THE FAVORITE CULTURAL DESTINATION AND WORLD BEST TOURIST DESTINATION FOR 2014. At the end of the debate, European Council on Tourism and Trade decided, unanimously, to award WORLD BEST TOURIST DESTINATION FOR 2014 TITLE TO REPUBLIC OF ZIMBABWE and to declare REPUBLIC OF ZIMBABWE THE FAVORITE CULTURAL DESTINATION in 2014. The meeting was also presented with the Official Invitation, from the Ministry of Tourism and Hospitality of the REPUBLIC OF ZIMBABWE, for a delegation of high ranking officials of the European Council on Tourism and Trade, to present the WORLD BEST TOURIST DESTINATION AWARD in Harare, in person, to His Excellency President of REPUBLIC OF ZIMBABWE ROBERT GABRIEL MUGABE, the most outstanding personality in Africa today. Awarding the highest world tourism prize of the European Council on Tourism and Trade; accepting the invitation for a working visit of high ranking members of European Council on Tourism and Trade to the REPUBLIC OF ZIMBABWE, are all momentous occasions and evidence of the admiration that all tourism experts have for the potential and future of tourism in REPUBLIC OF ZIMBABWE, concluded Professor Anton Caragea, President of the European Council on Tourism and Trade at the end of the meeting.